Hiring the right home remodeling contractor for building your home or home addition can be difficult and challenging. Heck, even finding a contractor can sometimes seem impossible, particularly when the housing market is strong. This said. compared to the pre-internet days the ability to at least identify home remodeling contractors in your local area has become much easier. However, just locating potential contractors for your home construction project is just half the battle. Once you have a few contractors interested in talking with you and bidding on your project there still remains the key question of, which one do you hire? After looking at all the bids you need to make a critical decision on which one will do a quality job, is easy to work with, and has the highest probability of staying on budget and schedule. With some upfront preparation on your part you can help to mitigate the chances of hiring the wrong home remodeling contractor. First and foremost know what you want built. Have a good set of plans for your home remodeling project in place before talking with potential contractors. 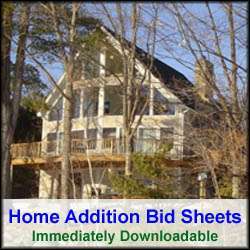 The plans should include dimensional information about the home remodeling project and include a list of materials. You should also know what time-frame you are looking to have the project started and completed. If you are building a home addition, go out and use stakes and strings to mark the location of your addition. Alternatively mark the lawn or ground with a can of spray paint where the addition will be located. Also take a trip down to your town hall and talk to the building inspector. Building inspectors can provide a wealth of information to help you understand what the permitting process. They can also take a look at your plans and highlight any issues they may see with them. They can also tell you if there are any restrictions or easements that you may need to contend with. Make sure to also visit your local home improvement store, or stores, to get ideas on building materials you want to incorporate into your home remodeling or construction project. In particular, check out major items that you anticipate needing such as doors and windows, appliances, roofing shingles, interior trim, and cabinets and countertops. Talk to associates in the store(s) to get their opinions on the best materials to use and their associated costs. Also, find out what the lead times are for the various products you’re interested in. Cabinets, for example, can take many weeks to arrive at your jobsite after placing the order for them. Similarly, it can be the same situation for doors and windows. Make sure to write down specific types or models of materials you are interested in and the cost of each. 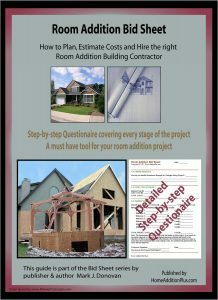 This way you can compare your home remodeling contractor bids with your numbers. If a contractor’s bid doesn’t break out costs, particularly for large items, then it’s a warning flag that they may not be the contractor you want to hire. With yourself fully armed with a good set of plans and detailed information on the various times you want incorporated in your home remodel or construction project you can now talk to prospective contractors intelligently. After interviewing home remodeling contractors and reviewing their bids, make sure to call their references. Call at least three references for each contractor you think you want to hire. Then compare all of the bids carefully once again. Eliminate contractors who did not provide detailed cost break downs, and committed schedules. Also, don’t be quick with tossing out the highest bid, or choosing the lowest one. Look deeper before deciding. Make sure you know what materials the low cost bidder is using before accepting his bid. If they are not clearly stated follow up with him or eliminate him from your short list. Once you’ve completed the reference checks and compared all of the bids carefully make your decision. Often the best home remodeling contractor to hire is the one who is moderately priced and who you felt most comfortable with during the interview process.